In all the hospitals that I have worked as ER provider, I have never neen asked about the ACNP. The only wanted FNP so they could see all patients. According to the ANCC, ER is a specialty and not role or population. The even have a certification for Emergency Nurse Practitioner. CRNA makes much more than FNP does. The only way I can come close to making CRNA pay is by doing ER. Even that is less per hour but in rural ERs you can do 24 hour shifts. Avg: fnp pay is around 95-100k Avg: CRNA pay is around 185k ER is satisfying. Aspects of clinic can be as well. I do have to say that 20-30 patients a day is NOT very satisfying. You don't have much time with the patients. I enjoy the extra time as a CRNA. I just did 3 years of 8:30 to 5pm clinic mon-fri, my own inpatients along with ER call 2 days per week. Now I'm doing 2 weeks on and 2 weeks off for way more money. In my off time I cover the ER some days in neighboring towns. I like aspects of both. I think being an FNP as really improved my anesthesia care of the patients. I think all NP specialties should start with a basic FNP and then specialize. Sadly, it is easier for the schools to make money by adding in informatics, business, MORE EBM instead of something useful(in the DNP). Much depends on the state you plan to practice. Are you in a good practice state or somewhere terrible like Texas or Florida? It is a totally different profession. NP all need to make the transition from floor nurse to independent practitioner. You do realize that we do the exact same job as our physician counterparts? You statement that "Most" states require a written collaborative agreement may be misleading. It is much more complicated than that. Personally, I would emphasize the independent practice in 22 states. Which states allow APRNs to independently deliver a broad range of services? The scope of practice for APRNs varies widely by state and specialty. For example, in the case ofnurse practitioners (NPs), the most numerous of APRN roles, 22 states and DC allow NPs to diagnoseand treat without physician involvement: (AK, AZ, CO, HI, ID, IA, KY, ME, MI, MT, NH, NJ, NM, ND,OK, OR, TN, UT, WA, WV, and WY. In contrast, 24 states require a formal relationship, documentedin writing, between an NP and a physician: (AL, AR, CA, DE, FL, GA, IL, KS, LA, MD, MA, MS, MO, NE,NV, NY, NC, OH, SC, SD, TX, VT, VA, and WI.) This relationship requirement varies from state to stateand could call for supervision, delegation, authorization, or more general direction andcollaboration. The remaining 4 states also require some form of relationship between NPs andphysicians, but do not require documentation of such relationship: CT, IN, MN, and PA. When itcomes to prescriptive authority, only 13 of the 23 jurisdictions that allow autonomous practice byNPs allow them to prescribe medications for diagnosis and treatment without the involvement of aphysician: AK, AZ, DC, ID, IA, ME, MT, NH, NM, OR, RI, WA, and WY. The remaining 38 states allrequire documented physician involvement for NPs to be able to prescribe medications. In the case of certified nurse-midwives, 18 jurisdictions allow CNMs to diagnose and treat withoutrequiring physician supervision or formal collaborative agreements; other states vary as torequirements for physician involvement. All states confer prescriptive authority to CNMs, although11 require physician involvement. For certified registered nurse anesthetists (CRNA) the ability to provide anesthesia in hospitals andoutpatient settings without supervision is controlled by both state and federal regulations. Stateregulations have to allow CRNAs to practice in hospitals and outpatient settings without supervisionfrom physicians, and the state must also opt out of federal Medicare requirements for physician 2 supervision (otherwise hospitals will not be reimbursed for CRNAs’ services). 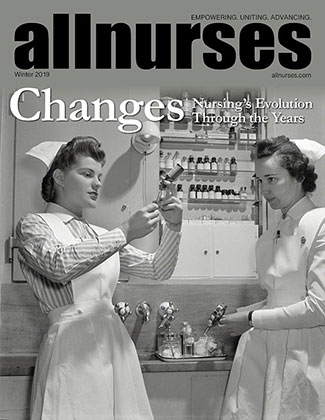 Currently, 16 stateshave state laws that do not require CRNAs to be supervised and have opted out of the federalsupervision requirements; other states either do not allow CRNAs to practice without supervision bya physician or have not opted out of the federal Medicare requirement for physician supervision ofCRNAs. I dropped mine in 1991. There is absolutely no reason to keep it once you are a CRNA. By MNA I am assuming you mean a masters in nurse anesthesia? All NP/CRNA programs only require a Masters degree at this point in time. That may be changing in the future(2015). You can get a DNP/DNAP in either now as well. You need to compare apples to apples. I happen to be both an FNP and CRNA and would be happy to answer any questions you have. Question in regards to job offers? Why doesn't the military accept online BSNs? Direct Commission Process: Possess a BSN degree from an accredited school of nursing. *Note: The U.S. Army Reserves will accept an Associate Degree RN but you must obtain a BSN by the time you go up to the promotion board for Captain. You do not need to become certified as a first assist as a NP. They have programs for non-np RNs to become RNFAs but that is not the same, close though. RNFAs are not NPs. You can bill for first assist as a NP or PA from day 1. No other certification needed, at least in the states were I practice. :) Most PAs and NPs who first assist learn by OJT. The hard part is getting the experience to get hired. An ortho surgeon who is hiring a FNP in Montana told me it will take him about 2 years of training until the FNP will be able to do what he wants her to do. There are some post grad course you can take but the best is simply OJT. The hours vary depending on what type of surgeon you work with. Ortho is the most common but I've seen them first assist neuro as well. YOu have two types of advanced practice nurses in the OR, CRNAs and NPs. The CRNA does anesthesia, chronic pain management procedures. The FNP is a first assist, usually working for a surgeon. They assist with the surgeries as well as see patients in the clinic, pre and post op. They also manage pt. who may be admitted postop. Get your FNP. Don't quote me but I don't believe adult NP usually work with antipartum. I doubt any ob/gyn office would hire you to see only postpartum patients. As an FNP you would be able to see them all. Online Rx with no exam or pt contact? What you find difficult (listening through a thin shirt) others with more experience may be able to perform quite well.